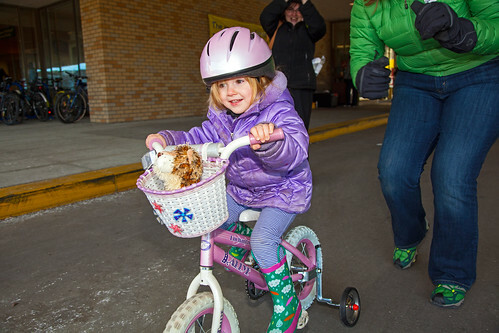 Last Sunday, over 375 children and their families convened at Legacy Emanuel’s beautiful and surprisingly sun-filled atrium to earn bicycles, helmets, and safety education. 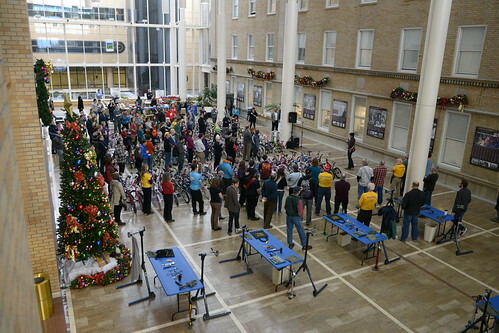 The Holiday Bike Drive is the culmination of a year of work by more than 500 volunteers who dedicate over 5,000 hours to clean and refurbish bicycles donated by generous members of our community. 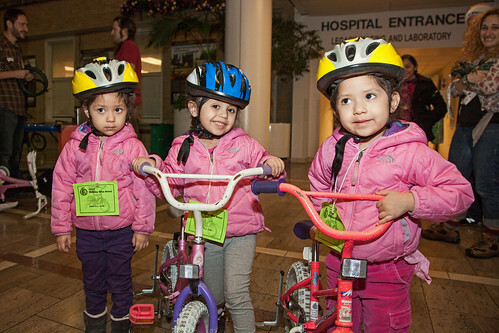 This weekend, we celebrated the 18th year of Holiday Bike Drive. 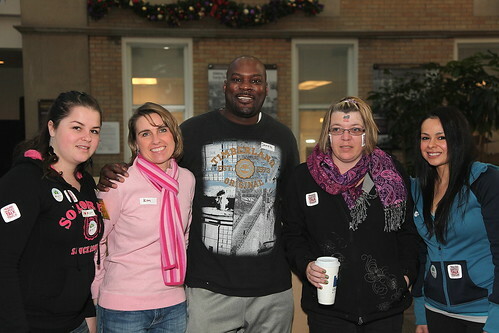 Those that have worked or volunteered at the event more than once know that each year is filled with unique stories. 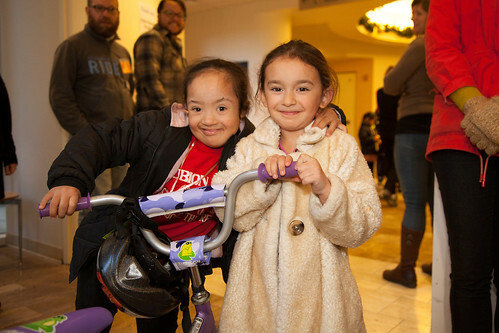 Every year, we see more of our community program participants connected to the Holiday Bike Drive and we recognized many familiar faces on Sunday. One Create a Commuter graduate shared the joy and passion he has for bikes with his grandson who earned a bike. 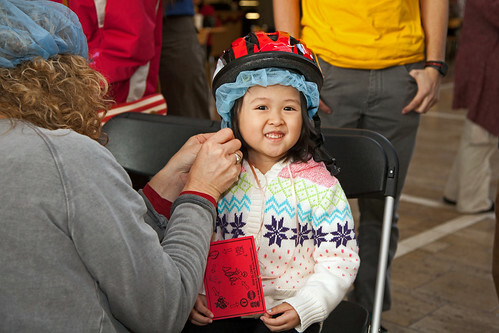 Two members of Hacienda’s bike committee, Andando en Bicicletas en Cully (ABC), helped facilitate lessons at the helmet-fitting station to children participating in the Holiday Bike Drive. 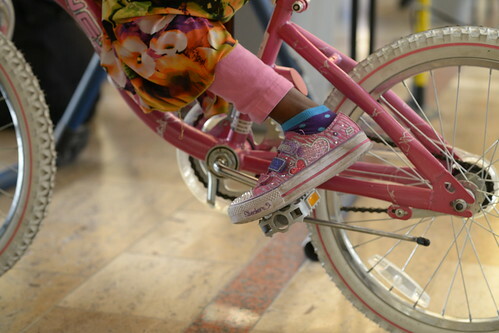 A young boy earned a bicycle and will now join his sister (a Bike Club graduate) and mother (a Create a Commuter participant) in riding around New Columbia together. Another member of ABC attended the Holiday Bike Drive with her two children who will now be able to ride with their mother to school, to the store, and around the Cully neighborhood. 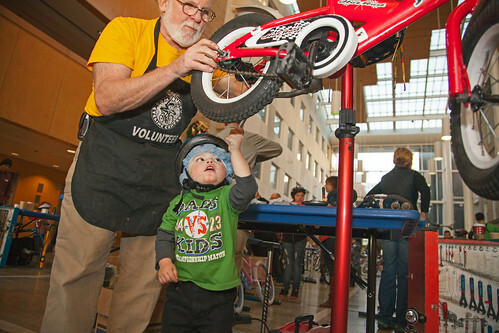 Whenever possible, we ensure that our events and programs are interconnected so that families gain the skills and tools to ride together. Randi also spoke with a man who did not participate in the event but instead was married to a Legacy Emanuel Medical Center employee. He is a disabled veteran, struggling to find work and expressed dissatisfaction in his life. 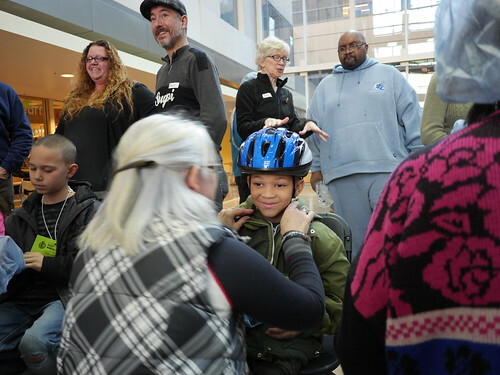 “He told me that when he came to pick up his wife at work, he was overwhelmed by the Holiday Bike Drive and all of these people working hard to get kids their bikes. He said, ‘It restores my faith in humanity. 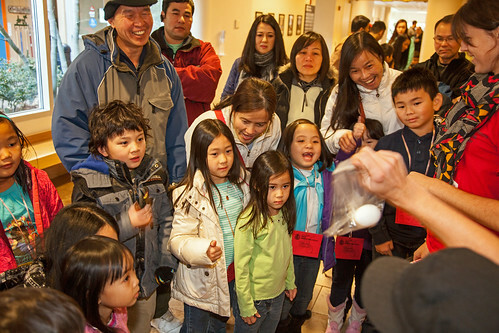 That people do all of this [pointing at the event] for these kids. It’s amazing.’” The man then expressed an interest in volunteering with the Community Cycling Center at a future Tuesday Drop-In Night. We are so grateful to the dedicated community of volunteers and donors that make our work possible. 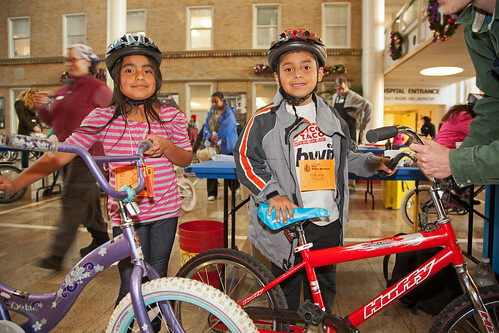 It’s not too late to make a gift to the Community Cycling Center’s winter fundraising campaign. Our goal is to raise $147,000 by the end of the year and so far we’ve reached the $60,000 mark. 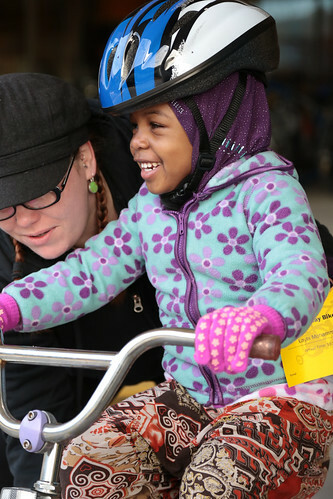 Please consider making a gift to ensure that everyone in Portland has access to the benefits of bicycles. We would like to thank our event sponsors: Legacy Emanuel Medical Center, Trauma Nurses Talk Tough, Cyclone Bicycle Supply, and Wilson Construction Company. 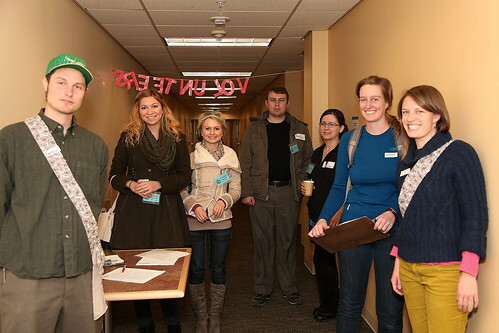 We received additional in-kind support from Russell St. BBQ, Great Harvest Bread Co., Grand Central Bakery, New Seasons, Dave’s Killer Bread, St. Honore Bakery, and Nossa Familia Coffee who helped power our staff and volunteers at this event.